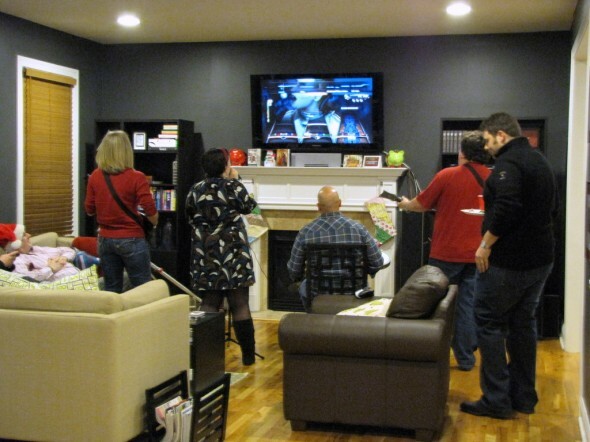 Other holiday parties: It’s a Wonderful House Party, 2009 Holiday Party. I loved it! 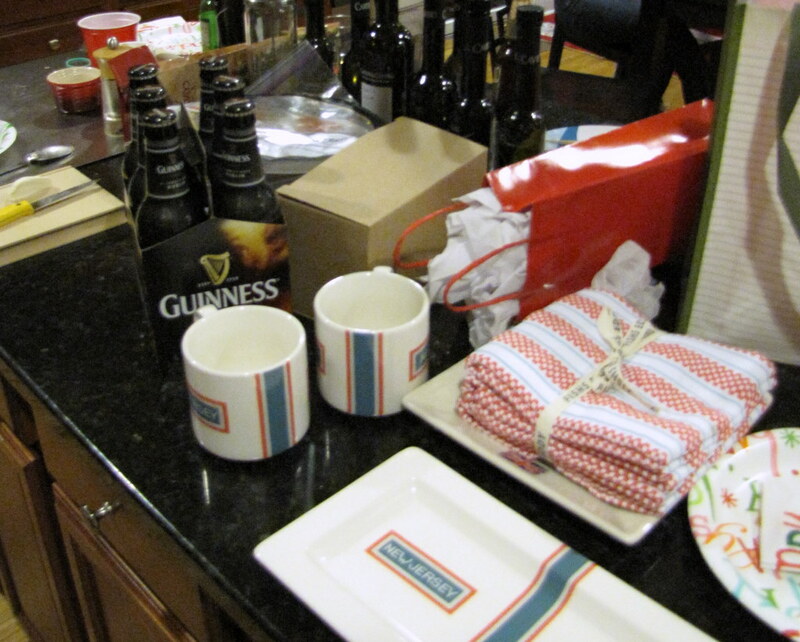 We had our party last night, and for the 1st time in our holiday party throwing history, it didn’t snow. 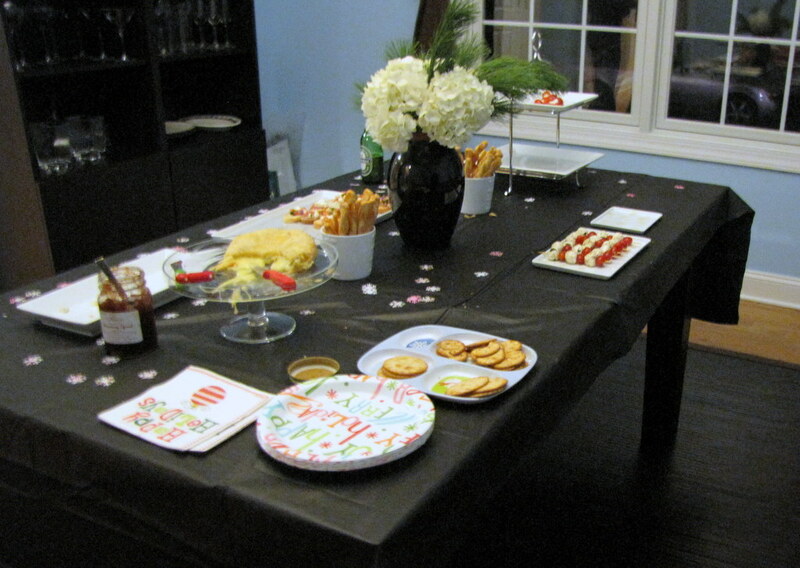 We had a great turn-out of about 16, I was really happy with the spread (but didn’t go crazy), AND we started the party early (5:30) so I was in my PJ’s before midnight. I live for the time spent in my pajamas, so this was exciting. It was Adam’s idea to start early because we have friends with kids, friends who travel from far-flung places, and friends who are double-booked this time of year and need to get to other parties (that start much later). I think it worked out perfectly. This year I remembered to take pictures of the spread when it was only *almost* cleared out. I never get pictures of the full experience. I did brie en croute, some caprese sticks, peppadews stuffed with herbed goat cheese (so easy and seriously delicious, peppadews are near the jarred olives). I made spanikopita and just kept throwing batches of them in the oven, they went very fast. Some Italian sausages and crostini. 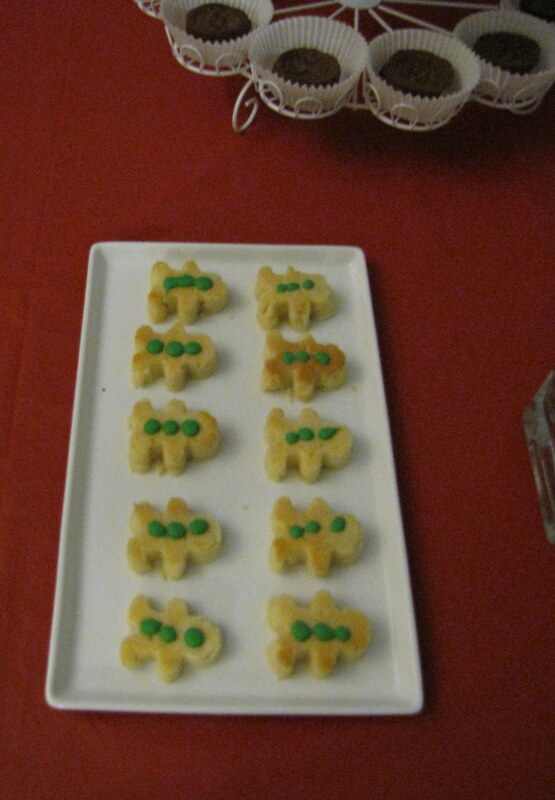 I had more planned for the dessert side but just had no time. Being sick this week killed my baking schedule, but it was all good. I did make these sugar cookie bites shaped like men (I have the silicone mold for them). I put out Whole Foods brownie bites and got my brother to make chocolate chip cookie sandwiches using vanilla frosting and Whole Foods cookies. Easy, delicious. The food definitely got eaten. 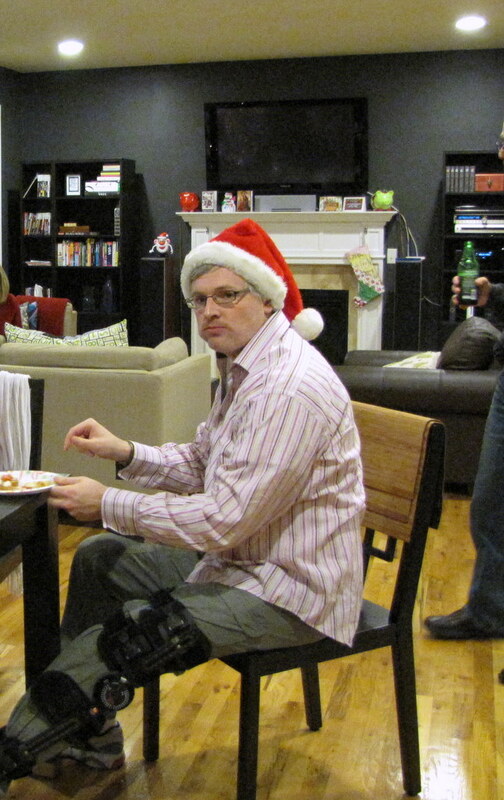 Dan had knee surgery, and plates of food just kept getting delivered to him. Lucky devil. The kitchen taken over by booze and gifts. Laura Ann gave me these great New Jersey/New York goodies from Fishs Eddy. I adore that store, and I adore these! And then the party turned into a Rock Band marathon, which was so much fun. My brother loves playing those drums, seriously. And those were basically all the photos I took. I did remember to take some this year, but not many. I had the best time, I’m feeling very hug-the-world today after a great night with great friends. I really do love our circle of people, they are phenomenal. Big Apple BBQ Block Party 2010!